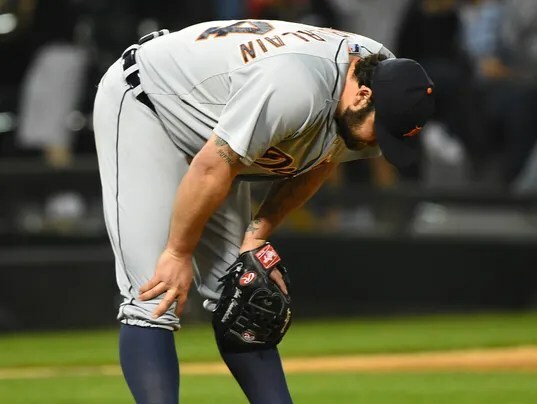 Watching the Tigers send out recently DFA’d Texas reliever Neftali Perez in the 8th inning, only to give up a grand slam in their July 21st loss to the Seattle Mariners, was emblematic of the awful state of the Tigers bullpen in 2015. But a good chef can make a stew out of even the worst ingredients. Unfortunately for the Tigers, in two seasons at the helm manager Brad Ausmus has stubbornly refused to deviate from the recipes in his beginner’s cookbook. As such, he has routinely used the worst pitchers in his bullpen for the highest leverage situations. Of the four Tigers relievers who pitch in above-average leverage situations, three are below average pitchers according to RE/24. The worst of the lot is Chamberlain, who has been awful since the all-star break in 2014, but was still the Ausmus’s go-to pitcher in the 8th inning until literally the night before he was designated for assignment. He was replaced in the 8th inning by Feliz, who has a RE24 of -6.68 on the season. Nor was this an aberration caused by a bullpen relying on rookie Angel Nesbitt in the beginning of the season and suffering through an awful start by Alburquerque (batters hit .324/.439/.618 off of Al-Al in 10 games in April). The same pattern was present in 2014, where Ausmus stubbornly relied on completely ineffective Joe Nathan to close when he was the second worst reliever in the bullpen. Even Chamberlain’s success is deceiving. According to Baseball Reference, Joba was dynamite in the first half, turning in a 2.63 ERA in 37.2 IP and a WHIP of 1.14. But after July, batters started teeing off on him. In his last 25.1 IP, he turned in a pretty awful 4.97 ERA with a 1.50 WHIP. But he remained the 8th inning guy even after the Tigers traded one of their few good prospects to get Soria. In comparison, the 2013 Tigers under Jim Leyland pitched their two best relievers, Joaquin Benoit (21.26 RE24) and Drew Smyly (18.39 RE24) in the highest leverage situations. Though, even Leyland stuck with Phil Coke (-9.63 RE24) in high-leverage situations despite having a less-bad left-handed option (Darin Downs, -0.62 RE24). This is a great way to analyze a manager’s use of his pen. I would add something important though. Because relievers throw relatively few innings/TBF, their results can fluctuation randomly, by a lot. A good reliever can easily post bad stats in 30 or 40 innings. Same for a bad reliever (posting good stats). You don’t want to fault a manager for bringing in a good reliever in high leverage situations and just because of poor luck, the reliever’s results are poor. Obviously on the average and in the long run, a reliever’s results will tend to track his talent, so using your approach is not bad. But it can definition mask good or bad bullpen management if 2 or 3 relievers happen to have significant bad or good luck, which is not that unlikely, again, given that they only pitch 60 or 70 IP per season. A manager should only make decisions based upon what he thinks the true talent of the reliever is – how he expects him to pitch going forward, and not how he has pitched thus far during the season. And he certainly does not know what that pitcher’s results are going to be in the future (although he should, ideally, be able to make a best guess – an estimate of true talent or a projection). In fact, let’s say that we estimated Joba to be a bad reliever at the beginning of the season, which he is/was. And let’s say that his manager knew that and mostly used him in low leverage situations, which he should. What if Joba pitched great (random good luck) for the first 20 innings. Any pitcher can easily have any result in 20 IP regardless of his talent. Should his manager now start using him in higher leverage situations? No! A bad manager will and he will be rewarded using your methodology, even if he reverts back to his true talent, which he should. So, what is the answer? The answer is to do the same analysis but to use projections rather than results. Ideally, you want to use a projection at the time each decision is made, but that is impracticable. So, you just use pre-season projections. That is going to yield a much more useful analysis, because, again, a good manager is going to use a projection (how he thinks that pitcher will perform today) each time he makes a decision to call him into the game. A bad manager may use his performance for the current season, or the previous day, week, or month.